Twist and shake and set it and play! 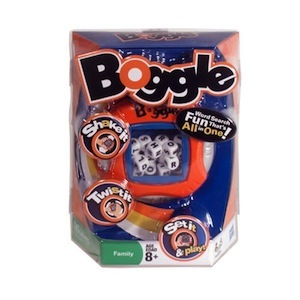 The Boggle game now comes in a compact case that's never been easier on the hands, ears or eyes. Just twist and raise the lid, shake the letter cubes in the quiet case, then search for words as the 3-minute timer counts down. The built-in timer changes color, then beeps softly to let you know time's up. And with no loose parts to worry about, it's as easy to store and take along as it is to play! Your favorite word search game is now easier to play than ever! Includes Boggle case with electronic timer and instructions. For 2-4 players. Ages 8 and up. PLUS the batteries are included!